There have been a number of so-called “jukebox musicals” in theater over the years, but few, such as The Jersey Boys and Beautiful: The Carole King Story, succeeded. That’s because the ones that failed had lots of memorable music but no story. 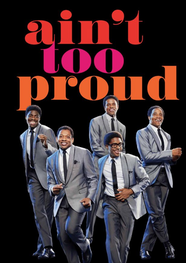 Now, following in the footsteps of the ones that worked, comes Ain’t Too Proud: The Life and Times of the Temptations, an out and out hit, and a great window on entertainment history. The play opened last week at New York’s Imperial Theater on W. 45th Street. Everybody remembers the Temptations, voted the greatest Rhyme and Blues group of all time. They had huge hits with My Girl, Get Ready, If You Don’t Know Me by Now, Ain’t Too Proud, Papa Was A Rolling Stone and other tunes in a career that has stretched more than 50 years. They charmed you not only with their fine tunes and silky voice, but with that smooth, gorgeous choreography which served as a show in itself. But there was also a lot of drama in the lives of the Temptations, all of them, and that is the heart of this terrific new play and the reason that it works so well. The play, written with great style by Dominique Morisseau, starts in 1967, the time of the Detroit riots, as Detroit’s Otis Williams is trying to sign up singers for his new music group. He gets singers from his high school and neighborhood, bass Melvin Franklin, Paul Williams, Eddie Kendricks and flamboyant lead singer David Ruffin. They went through several names before settling on The Temptations, grabbed their song sheets and headed for the stage. The story of the Temptations mirrored the story of America in the 1960s and ‘70s. The black group could not stay in white hotels after appearances in the South, suffered through the assassination of Martin Luther King Jr. and debated, as all African American music groups did, about what should they do, as high profile people, to help the Civil Rights Movement. They put up with rickety old tour buses, argued with their early manager and thirsted for fame. There are very funny scenes in the play. In one, their new, aggressive manager, madder than hell at them, flies off the stage in a gorgeous, gleaming convertible. In another, Otis follows Motown head Berry Gordy into a theater’s men’s room in order to meet him. A minute later, all four Temptations singers run into the men’s room, too. Later in the show, during the Vietnam War era, producer Berry Gordy tells the Temptations that the Vietnam protest song, War, will not go anywhere and that they should not record it. Someone else did and the song became a monster hit (“So I’m not always right…” bemoaned Gordy on stage to laughter from the audience). Gordy took them into his stable of talent that included Diana Ross and the Supremes. The Supremes, who performed a number of songs, were a delight, led by Candice Marie Woods as Diana Ross. Writer Morisseau was wise to let Otis Williams be the narrator of the show. The musical (and a previous TV movie) were based on his autobiography. He was with the group all of its life and so he can tell the story as an eyewitness and actor Derrick Baskin, as Otis, does a fine job holding the different segments of the tale together. Director Des McAnuff does a fine job of letting his actors flesh out the characters. The performers in the show are all wonderful. Some of the standouts are James Harkness a the alcoholic Paul Williams, Jawan M. Jackson as the deep voiced and flip Melvin Franklin, Jeremy Pope as the charming Eddie Kendricks, Ephraim Sykes as the bouncy, devilish David Ruffin, who brings the house down with his leg splits, body whirls and microphone flips, Jahi Kearse as produce Berry Gordy, Christian Thompson as Smokey Robinson, Shawn Bowers as Otis’ son Lamont and Nasia Thomas as singer Tammi Terrell, who died at 24. All of the Temptations’ great hits are performed on stage, to the out of this world, fabulous choreography of Sergio Trujillo. Ain’t Too Proud… is the story of the changes a group has to make, even when it is successful. The best example is the arrival and departure of sensational singer David Ruffin, later a star in his own right. He was a brilliant singer but an emotional mess who dragged the whole group down with him. Another singer, Eddie Kendricks, had the same problem and he was dismissed. There were singers who left to bask in retirement and one, Paul Williams, forced out after he became a bad alcoholic, later killed himself. There are several themes in the musical that were common to all music groups in the 1960s and ‘70s. One – how do you keep a group together when members are in turmoil. A number of groups collapsed because of inner friction in that historical era, but not the Temptations. Leader Otis Williams worked hard to find talented people to replace the talented people who were let go or quit and the group survives today (24 different singers over the years). Second, how does a group that is very successful in the ‘60s with one style of music (reflected by My Girl) shift gears and come up with new music in the ‘70s and ‘80s, such as Papa Was a Rollin’ Stone? Third, how much does a group and its members have to give in to the wishes of the producer, Berry Gordy? He was a genius and they knew it, but still fought for themselves. Fourth, the Temptations were always competing against some other group. At Motown, they had the enviable job of competing against the Supremes not only because of the Supremes’ enormous popularity, but because Berry Gordy was in love with Diana Ross. And at the same time, the Temptations, a black group, had to compete against white groups and constantly had to avoid the tag of a “black music” group and still perform crossover music for mostly white audiences. They were a reasonable success despite all of that, led by the hard working Otis Williams, who, because of tours, did not see his wife and son very much and missed them. The group’s story was at times glorious and at time difficult, as it was for all the ‘60s music groups who had to compete against each other and the changing times. The play is a great behind the-scenes look at the history of the Temptations and American music. The Temptations did battle with the Supremes, Beatles and other groups and with their own, personal demons. too. If you see the show, remember, they’re gonna make you love them…..
PRODUCTION: The show is produced by Ira Pittelman, Tom Hulce, the Berkeley Repertory Theatre and others. Scenic Design: Robert Brill, Costumes: Paul Tazewell, Lighting: Howell Binkley Sound: Steve Canyon Kennedy, Projection Design: Peter Nigrini, Fight Director: Steve Rankin. Choreography: Sergio Trujillo, The play is directed by Des McAnuff, It has an open ended run.